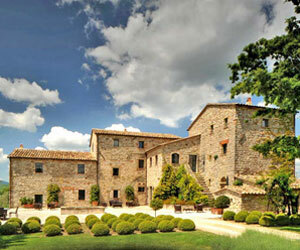 Arrighi is one of ten 5-star luxury villas available to rent on a private estate of Castello di Reschio. This private estate covers 2,000 acres of Umbrian countryside with expansive views of rolling hills, olive groves and vineyards and forests of ancient oak and chestnut trees. Little has changed since St. Francis of Assisi preached here in the Middle Ages. Arrighi is built on the foundation of an 11th century watchtower. That alone will tell you that the views are incredible! It includes commanding views over the Niccone valley stretching out to the Tuscan countryside with views of rolling landscapes and forests as well as the Sorbello castle in Tuscany and the estate's own Castello di Reschio in Umbria. A lot of the landscape remains the same over thousands of years. Arrighi is a meticulously restored property. The imposing L-shaped Main house was originally the fortified farmhouse and watchtower. A gravel road takes you to entrance where you first pass the guest cottage before arriving at the large paved courtyard with large Italian fountain that sits in front of the villa. While maintaining its original features, the renovation includes a touch of modern, the main feature a glass encased external staircase tower that continues on all three floors of the main house. It offers a lot of light and creates a feeling of extended space in the villa. Enter into the foyer with an atrium staircase that is open to the upper two floors. To the left of the entrance hall is a living area with fully equipped eat in kitchen. Adjacent to the kitchen is a large walk-in pantry. A hall from the living area leads into a dining room with seating for twelve guests. Beyond the dining room is the spacious formal living room. On the right of the entrance is a large double bedroom with en suite bath and tub and separate shower and doors that lead out to the garden. Up one flight of stairs is another large living room that leads to a master suite with a double bedroom, shower room, bathroom with tub, dressing room and study. On the other side of the stairway is another double bedroom with en suite bathroom with shower. Another flight of stairs leads to two double bedrooms, both with en suite bathrooms with tubs. Enter into a living room with kitchenette and a double bedroom with en suite bathroom with shower. Outside are terraces for outside dining with spectacular views of the surrounding countryside. There is an 18 x 4 m infinity pool with deck chairs, and a pool house with bathroom and shower. • Not suitable for children under 12 years.